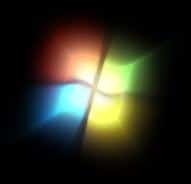 Windows 7 users who aren’t happy with the default boot screen animation or users who’re fed up of seeing the same boot screen animation every time Windows boots might want to change it with a custom animation or static picture. The good is that it’s now possible to customize the Windows 7 boot screen by replacing default animation and default Starting Windows message with the help of a free tool. A little over one year after the Windows 7 RTM build release, Jeff Bush at Coder For Life website has released a free tool that does the miracle with a click! 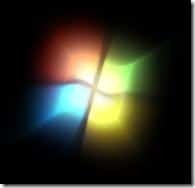 Yes, you can now replace the Windows 7 boot animation with a custom one. Windows 7 Boot Animation Updater is a small tool that not only allows you to change boot animation but also edit “Starting Windows” and “Microsoft Corporation” messages in a jiffy. Before you jump to the download page, let us remind you that this is an advanced tool and one should backup Windows and data or at least create a system restore point as this tool edits or replaces some original system files. We suggest you run this tool with admin rights to avoid errors. 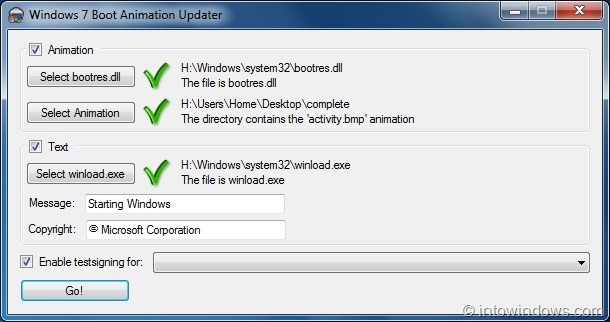 Note: A new version of Windows 7 Boot Animation Updater has been released. Please go through Windows 7 Boot Updater beta version released article to know what’s new in the latest version. The latest beta version of Windows 7 Boot Updater is stable and works fines on most of the machines. Still, we recommend a complete image backup of your OS drive to avoid any issues. I don’t know what you guys are doing wrong, but it works perfectly for me. I wish I could use images larger than 200×200, but I’ll get over it. Also in my comp, it does not work. My comp is in win7 already and i don’t know why when it boots it’s still in vista. Jeff, many thanks for informing about the update. Will cover it. The program has been majorly updated recently and it would be nice if you updated your post. Please email me so that I can put you on the list for future update notifications. Não deu certo no meu, pq????? Espero q de certo com alguem aí por favor postem pra galera. my go button is disable?? ?